Kirsty Murray has a talent for writing historical fiction, sometimes as straight historical fiction as with the Children of the Wind series, and also as a time slip novel, like Market Blues. This book is a time slip novel, which takes Lucy back to the late 1930s. As is often the case with time slip novels, Lucy is not happy, she feels abandoned and very hard done by. Her sister has had an accident in Paris so her mother has to rush off to be with her. Her father is working on an important project, which means he can't look after her either, so Lucy is shipped off to the bush to stay with her Great Aunt Big. She doesn't really know Big, and she doesn't like the great outdoors, so the summer is not looking that good for Lucy. Lucy's disinterested and grumpy mood soon changes however when one night she finds herself stepping through the painted wall of the dining room, and finds herself back in 1938. Here she meets April, who looks so much like her they could be twins, April's brother Tom and her best mate, Jimmy Tiger. Throughout her stay at Avendale she visits them four times, in each season, and experiences a glimpse at what life was like 75 years ago, end even gets caught in the bushfires of Black Friday in 1939. What I loved about this book was the relationship between Lucy and April and how that changed the relationship Lucy has with Big. It makes me wish that I had a painting I could walk through to go back and visit my Nan when she was a girl. What you see in this book, is that despite what people may look like on the outside (grey hair, old bones) they still have the memories of childhood inside them, and that doesn't go away. 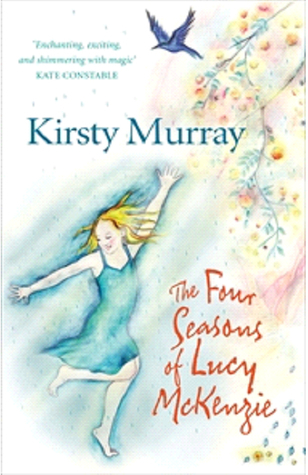 I have to say that I read this book because I love Kirsty Murray’s writing. If I didn’t know anything about the author or the story I am certain I wouldn’t have picked up this book…because of the cover. It is only my opinion, but I think it in no way does the story justice, and it may be a book that needs a little assistance getting into the hands of readers because they won’t pick it up based on the cover.